Jeff McCord’s iPhone remake of the 1980s classic Sword of Fargoal has arrived in the App Store. We were excited to preview the iPhone remake of this dungeon crawler back in November. 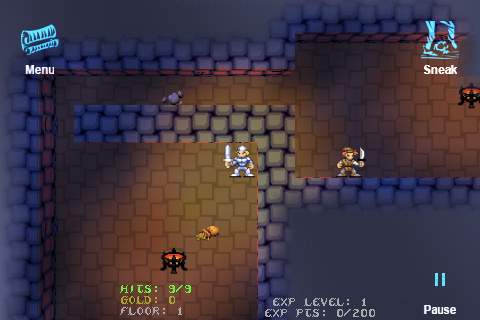 In a nutshell, the Sword of Fargoal places the player within the top level of a deep series of dungeons with the quest of seeking out the legendary “Sword of Fargoal" and escaping with it from the depths of said dungeons. Complicating matters is the fact that the layout of each dungeon level is randomly generated when the player enters it, and that the dungeons are all initially bathed in darkness, revealing themselves only as the player explores. Those lucky enough to locate the sword have only 2,000 seconds to find their way out of the dungeons which, even on the way up, are also randomly generated. The iPhone version features completely redone graphics utilizing OpenGL ES to add depth to the stony visuals. It allows for pinch-and-spread zoom control to focus on the action at hand and features an optional on-screen mini map to aid in negotiating the twists and turns of each dungeon level. What’s more, the developer has implemented a full, real-time music synthesizer system for the game which delivers sound that, while ringing of retro, surpasses the quality of the C64’s SID-based score. But, really, what makes the game so well suited for the iPhone is its casual nature as compared to the typical roguelike. And that’s not to say the game is shallow or light on dungeon crawling action, but rather we feel it’s simply a bit more accessible to the typical gamer than, say, Nethack, Moria, or Rogue thanks to an economy of controls, spells, and the like. Those who’ve never played a dungeon crawler before might just find themselves drawn in to Sword of Fargoal. Early impressions from our readers are also quite positive, including great first impressions from the Rogue Touch developer as well as from at least one skeptic. The game is on sale 40% off during its first week.